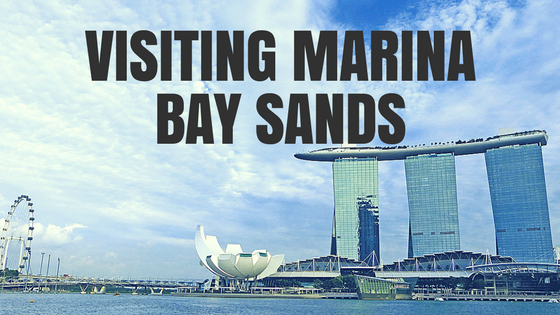 One of the main things to do on a visit to Singapore is to visit the amazing Marina Bay Sands. With the Marina Bay Sands located at the Marina Bay in Singapore. This resort includes a 2,561-room hotel, a 120,000-square-metre (1,300,000 sq ft) convention-exhibition centre. There are Shops at Marina Bay Sands mall, a museum, two large theatres, “celebrity chef” restaurants, two floating Crystal Pavilions, a skating rink, and the world’s largest atrium casino with 500 tables and 1,600 slot machines. With the complex is topped off by a 340-m long Skypark with a 150m infinity pool overlooking the city. Staying at the Marina Bay Sands hotel has its obvious benefits of mainly access to the infinity pool on the roof. If you don’t stay at the hotel, there still plenty to do. 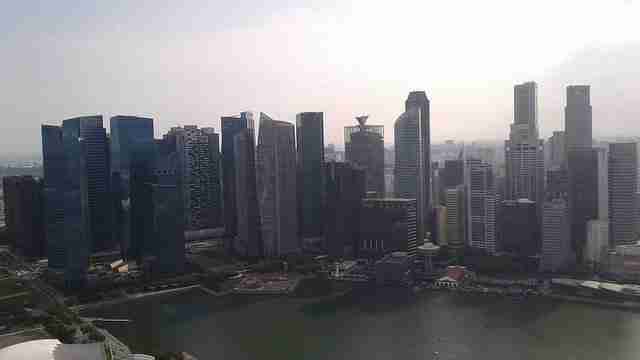 We decided to go to the observation deck with the tickets costing us S$23 for adults. The elevator was plenty quick on the way up to the observation deck. As we walked out onto the deck we could see the amazing views straight away. With been 200 meters above ground, there was information boards to help us figure out what we are seeing from up here. The entrance ticket allows visitors to enjoy these incredible views as long as they want. You won’t be able to swim in the infinity pool – this is only available to hotel quests. 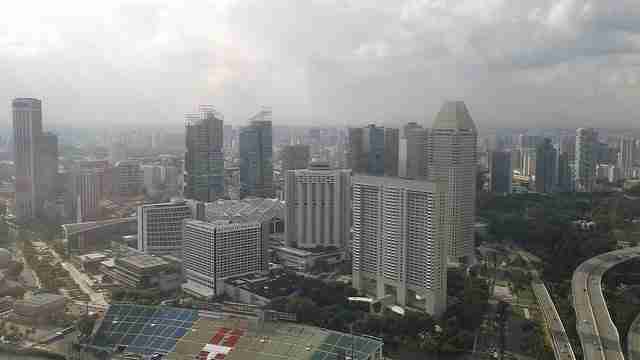 But at least you get to enjoy the great atmosphere and views of Singapore from the observation deck. 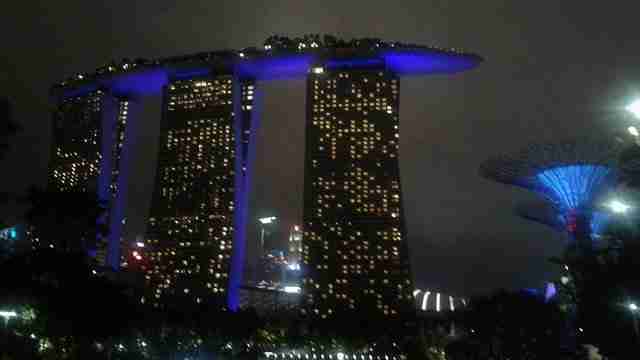 Every evening the Marina Bay Sands runs Wonder Full, a water and light show. It’s truly a spectacular show filled with color, music, laser, water and even fire, that goes for around 11 minutes twice in the evenings. 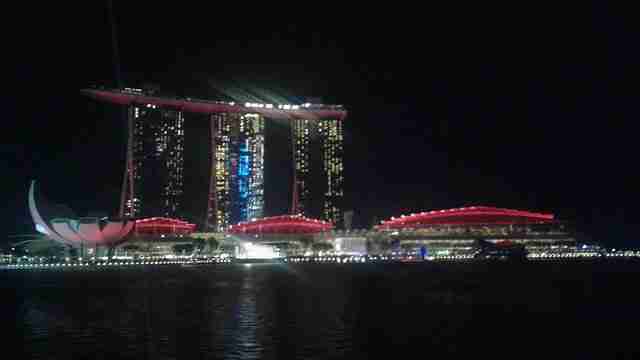 Hope you enjoyed this post about visiting Marina Bay Sands in Singapore. Please feel free to leave a comment.